Donald Trump said "I don't really. I think it's a small group of people," in the Oval Office. Donald Trump said he spoke to New Zealand President after the "horrific" mosque attack. 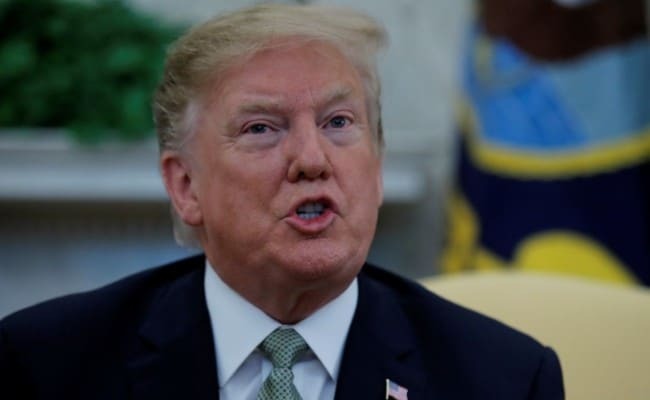 US President Donald Trump on Friday dismissed concerns that the massacre by an apparent white supremacist in New Zealand indicates a dangerous trend. Trump was asked if the killing of at least 49 people in two mosques in Christchurch by a man claiming that white people are being overwhelmed in their historic homelands demonstrates a rising problem around the world. "I don't really. I think it's a small group of people that have very, very serious problems, I guess," Trump told reporters in the Oval Office. Although Trump referred to the bloodbath as "horrific" and "terrible," his comments downplaying the potentially wider threat were likely to face criticism. Trump has been repeatedly accused before of making comments that were at best insensitive and at worst racist when it comes to race relations and far-right movements. The alleged gunman -- identified as an Australian white nationalist -- apparently livestreamed the assault on social media and published a manifesto filled with racist conspiracy theories. He also referred to Trump as "a symbol of renewed white identity and common purpose." Asked if he'd seen the manifesto, Trump said: "I did not." Earlier, he tweeted that he'd spoken with New Zealand's Prime Minister Jacinda Ardern to express "solidarity" and to say, "We love you New Zealand!" In 2017, even many of Trump's closest supporters were reportedly appalled by his refusal to condemn a march by torch-bearing neo-Nazis in Charlottesville, Virginia. The march ended in violent clashes with leftist protesters and Trump appeared to spread the blame equally, even though the right-wing demonstrators had been chanting a Nazi-era slogan "blood and soil." "You also had some very fine people on both sides," he said. In December an American neo-Nazi was sentenced to life in prison for driving his car into a group of counter-protesters during the white supremacist rally, killing a woman. Trump has also been accused of whipping up xenophobia with his long-running campaign to build more walls along the US-Mexican border, which he says is under "invasion" by illegal immigrants. On Friday, he signed the first veto of his presidency to dismiss congressional pushback against his declaration of emergency powers to get billions of dollars in wall funding. Trump has repeatedly denied racist tendencies and often touts his work in improving economic conditions among the country's racial minorities. However, the right of his party, which includes his most reliable political base, increasingly flirts openly with white nationalism and wild conspiracy theories. Rush Limbaugh, the popular right-wing radio host, said Friday that the New Zealand bloodbath may even have been what conspiracy theorists call a "false flag" designed to discredit Trump. "There's an ongoing theory that the shooter himself may in fact be a leftist who writes the manifesto and then goes out and performs the deed purposely to smear his political enemies, knowing he's going to get shot in the process," Limbaugh said. Brian Levin, director at the Center for the Study of Hate and Extremism, said, however, that the problem could not be more real. "White nationalism and far right extremism is the most prominent extremist threat facing the United States today, and indeed it is a worldwide phenomenon," he said.